What Is My Identity? Who Is 'The Me'? My blogging pal with pen name The Fool and author of the wonderful blog : Lucifer House Inc. has suggested the topic, 'The Basis of Your Identity - Caste, Language, Country, Profession or Ideals' And I liked this very much, because 'Who is Me? ' is the eternal question which bothers everybody. The spiritual journey starts with this question. Today of Buddha Jayanti - The prince Siddhartha left his kingdom to realize his identity was restless by the same question and who has become Buddha – The Enlightened after the realization of the answer. Also, today is Narada Jayanti, and Narada is the Sage who has enlightened countless lives. 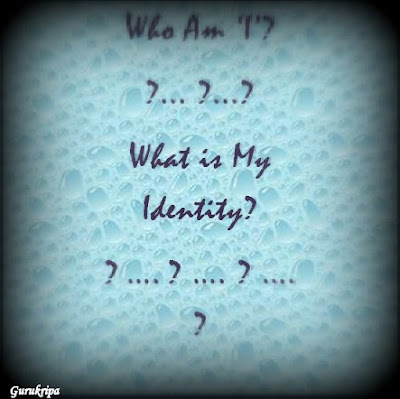 I am happy to share the thoughts on this question ‘Who is ‘Me?’ very auspicious day. We get some identity by birth, by the name of our family, the mother and father. Then we get some identity by school and some by the college. People know us by some religion, culture, country and for our social status. But there is ‘still’ something which does not allow us to feel satisfied. There is ‘something’ more than all this, for which people know us, love or hate us and that is something beyond what we already know. That is really ‘Me’. Really Me! Who is ‘Me’? When people know us, by the identity of our family, then why aren’t we happy with that? What makes us strive hard to make our own identity? By our school success, cute face of childhood, we have some nice identity, why don’t we remain with that identity for the whole life? Of course, if we do so, the same people who loved us, because of school success may laugh then, for the reason we are not highly educated. Nothing satisfies us, whole life, because we are searching ‘Me’ Here I wish to mention one thing, we say that we are always happy or my life is successful but still that feeling of happiness is not everlasting. And if we don’t feel the happiness which is eternal then what is that which is somewhere inside makes us sad or steals our smile? But what is ‘Self-realization’? 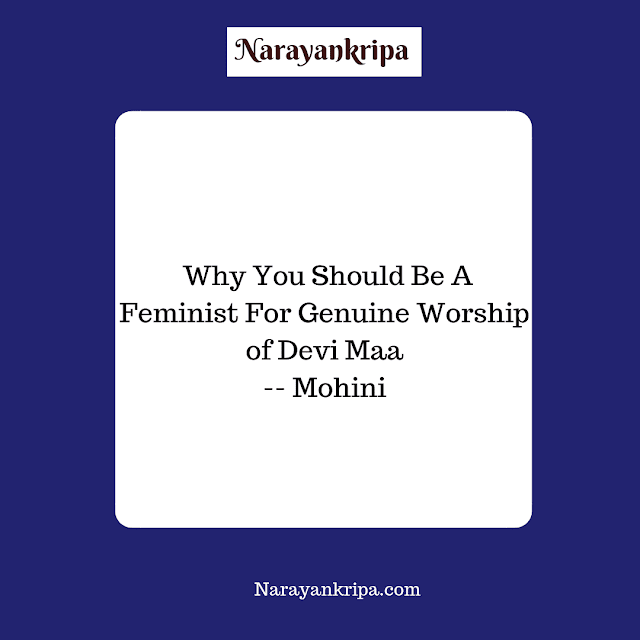 I am Mohini and that’s my identity, but is it my complete identity? 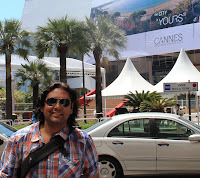 My thought process, restless questions of many years since childhood, my search for my own self is my journey of life. I think, this journey of thoughts will bring you closer to yourself and the ‘Self-Realization’. First thing, I knew about myself was I am a Brahmin. Brahmin is considered as upper caste in India, and hated now for political benefits; also I came to know that this caste system is different from the Varnavyvastha which was really in existence in India before invasions, by Rajiv Malhotraji’s lectures. So this has different dimensions. In childhood, I found the meaning of ‘Brahmin’ as ‘The Person who really knows The Brahman’. It’s the ‘Me’. This is known as Mahavakya in Indian spirituality and Advaita Philosophy, ‘Aham Brahmasmi’. This means when I will realize that ‘I’ am not different from the ‘Brahman’, I will be the Brahmin in a true sense. And in simple words, ‘Aham Brahmasmi’ is the self-realization. So, I realized theoretically, here I must say realized and understood the concept by words, what is Brahmin and what should be the goal of life. There won’t be eternal bliss, without ‘realizing’ this fact, not just understanding by reading the books and by the theoretical knowledge. This is called as Paroksha Gyana. Now, the caste issue created by invaders looks ridiculous, because everybody should realize the Brahman, and become Brahmin. This realization brings the complete and eternal relief from the illusion of mind and thoughts which we are ‘Dvaita – The illusion which makes us feel different from Brahman or in other words the Almighty.’ This illusion is known as ‘Maya’. By this ‘Maya’ we feel the existence of this world, our sorrows, and joys, good and bad things happening in life, victory and defeat, anger, love, and all the feelings. But when we realize our identity, our Sva- Roop we are free from all the above forever and we live in eternal bliss. When we experience, the complete bliss without the Shad – Vikara (Kama - Desires, Krodh – Anger, Mada - Arrogance because of high ego , Moh - Attachments, temptations and attractions in which sometimes we forget difference between right and wrong e.g. We know we have a cold and still we eat Ice cream then it's Moh, Lobha - Greed, Matsar – Jealousy. These meanings are not the complete and exact meaning but somewhat similar words which can only give a somewhat idea.) 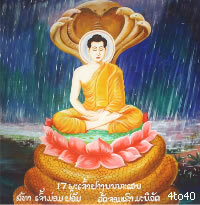 we realize the pain – Klesha we experience every moment in life. Because of Maya, the Dvaita, we feel that we are enjoying the life, but all the happy and sad feelings are the experience of mind and mind is never stable in one stage. When I came to know all this, about being Brahmin, a new journey, a Sadhana towards this goal started. 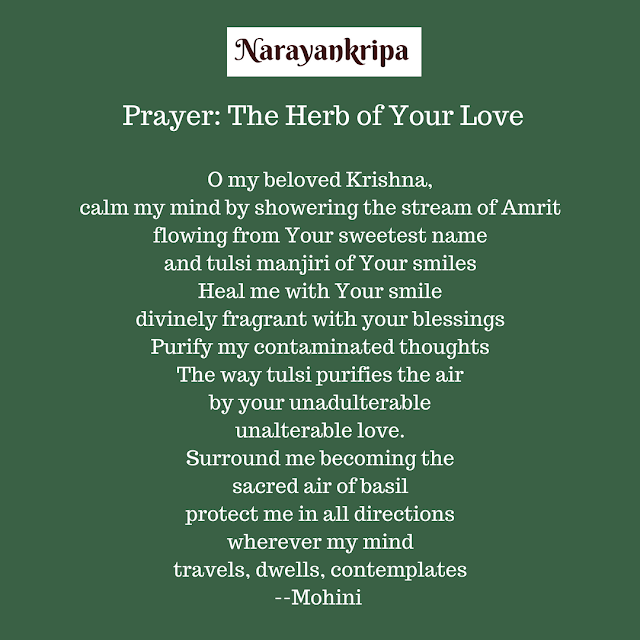 The complete bliss I have now in the life is by Gurukripa. At one moment I thought ‘I’ will get the ‘Moksha’ self-realization by my efforts and without The Sadguru. This is impossible and funny too because all the efforts are the part of the mind, thoughts and so the ego. When the ego dissolves, we realize the oneness with everything, Advaita. The Sadhana, devotion, worship, rituals can make us pure from inside, but to melt the ego, I really feel, we need Sadguru, not a person who will fulfill all your desires by his/ her blessings but a person, who is enlightened and has the ability to enlighten others, just like we lighten one Diya by other, or one candle by other. A true Sadguru never gives what all we want, but gives us a life without attachment and teaches the best way of performing Karma, that we should do our Karma at best from our side without the attachment. By Blessings of, Grace of and in perfect words by the love like a mother, Sadguru awaken the Viveka within us. Viveka means what is right and what is wrong. Spiritually, what is right for the Moksha and what should we avoid in our Sadhana which brings us again in the material world. After really awakened by the Viveka, our life starts becoming more and more peaceful, we may have struggles, tears, extreme happiness, the unexpected incidents which may break us or make us fly in the sky, nothing affects and disturbs the inner peace. This is a process going on by the Mahayoga Sadhana – everything becomes so easy and natural. We do not have to wear the Smile but it stays naturally. When we become the ocean, the thing which always keeps us restless, though we achieve the desired success in life, which we have discussed in the beginning, vanishes and we experience eternal bliss. This is Advaita – Nondualism. Though we realize and feel the oneness, the enlightened soul live within the limits of the material world, completely detached, experiencing the complete love, eternal bliss from inside. And, that really reflects that person’s personality. So, when I know, what is the goal of my life and though I am on the path to realizing that ‘Me’, you see, now I wrote that me, means I am feeling the Brahman, something different from me, difficult to understand from within. But actually it’s the easiest, because that 'me' is really Brahman, ‘This Me’, I can’t just give up the material duties, all the duties are the part of the spiritual journey. In fact, there is no difference in material or spiritual life, this is only our perception. Another journey started, to know my own identity of being Hindu. I found, Hindu is not a religion, this is a culture of this land Bharata – India or by identity Hindusthan – the land of Hindus. Hinduism can’t be fit in any ‘ism’, because all our scriptures, Vedas, Upanishads which are most important for us, teach only the self-realization and how to experience it, different paths, Yoga like Karmayoga, Bhaktiyoga, Gyanayoga. And this self-realization is necessary for every human being, even every living animal, plant. But it’s not possible for them for the limitations they have by birth, the Human Life is considered as the most ideal for the Sadhana of Self Realization. And the rules, rituals we find in the Puranas, are for the Dharma, for the happy life of a human, a society and for the spirituality. "When we think of the Hindu religion, we find it difficult, if not impossible, to define Hindu religion or even adequately describe it. Unlike other religions in the world, the Hindu religion does not claim any one prophet; it does not worship any one God; it does not subscribe to any one dogma; it does not believe in any one philosophic concept; it does not follow any one set of religious rites or performances; in fact, it does not appear to satisfy the narrow traditional features of any religion or creed." Here, I think the word Ideal should be added, Ideal way of life. This verdict has very well described the terms Hindutva, Hinduness, and Hindu. And I feel, everybody should feel proud of their culture, their land, their glorious past, but if the beliefs we have, are going against humanity, we should happily leave them forever. Hinduism really brings this very Viveka in your life. So, Hinduism is just beyond the concept of religion. I think almost all aspects are discussed now, still one more important aspect remains as Gender, The Self Realization makes us free from all the ‘Ego’ and then we can feel beyond male or female – just as a human. Topic dealt with very nicely. Think I too have more or less the same view point. I am curious to give this topic to someone who does not believe in spirituality or an atheist and see how he/she deals with it. Welcome to Gurukripa TF and thanks. I also will love to know the thoughts by the atheist.